Just when I thought that there wouldn't be any new Scooter singles from their 2008 completely jumpstyle album, "Jumping All Over The World", a surprise came to Scooter fans all over the world as newest band member Michael Simon revealed on his MySpace page that a fourth single was forthcoming. He first posted a short clip of the song "I'm Lonely" from the album, only it seemed like a complete remix! Later on, Michael created a quick post to inform us that it was indeed the next single (with a trance B-side to boot). 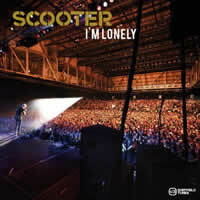 The official single was first played in full to the British crowds during the Clubland UK tour in March 2008 within which Scooter was a performing act. So now the fourth (and presumably final) single has arrived; how does it fare? The Radio Edit, as well as all other versions of the track available on this single, is a great departure from its album counterpart. Instead of the almost primitive-sounding synths that were present on the album version, we are treated to more stadium-style punchy synths in all aspects. In fact, very few aspects were directly carried over from the album. Only the MC shouts of frontman H.P. Baxxter were retained, although they were re-recorded. The high-pitched vocal chorus was also kept, but surprisingly re-recorded, and for the better: they sound much more real (and heartfelt, if you could possibly believe that) and slightly higher pitched. The background music of the verses has been completely revamped, instead borrowing handsomely from the hook of the trance classic "Fly Away" by Vincent de Moor. The instrumental refrain has also been recomposed; while more simplistic than the album version, it still packs a punch that will make concert-goers flail their arms in the air like they just don't care. There really isn't a bridge in here, except for more of the refrain, coated with brand new H.P. shouts. At least he shouts particularly loudly and crazily near the end like he used to back in the day. The one thing I found unusual was the abruptness of the end of the song; it feels like a rushed conclusion. The Extended Mix is quite similar, although it starts out a bit differently than the standard extended mix with a funky (although a tad lifeless) bassline and has a quick chopping effect before H.P. 's first verse. The 'Dressed For Success' Club Mix is a similar affair to the other two, with a couple of important exceptions. First off, the build-up is a bit more straightforward in getting to the "Fly Away" part. However, most importantly, the vocal chorus is gone and has been replaced with just angelic background pads to give us a taste of what the refrain's melody should sound like. The M.C. vocals have also been retracted, leaving for a purely instrumental work that might get the dancefloor going, although the high-pitched vocals are probably more recognizable and enjoyable by the crowd. Finally, we are given a treat in the form of a new B-Side, entitled Way Up North, presumed by many an official Scooter-forum-goer to be an homage to The KLF. Everything is, according to them. It starts off with a house beat but quickly moves into trance territory, topping itself off with a snappy and energetic trance melody before a trip into a more downtempo vibe. A new voice, known only as "Kamala", gives us a simplistic whispy moaning over pads, but the sound is ultimately quite alluring. Then we return back to the thumping trance from whence we came. I have to say it now: this is the most inventive and ensnaring B-Side of all the singles from the "Jumping All Over The World" album, and thankfully, it isn't jumpstyle, a genre that I am soon to grow tired of. It also sounds like they put some more serious effort into the B-Side, unlike previous ones while sounded like a five-minute paste job. Overall, I'd say that "I'm Lonely" is an attractive single and certainly one that trumps the album version, at least in energy level. That being said, it is a tad unfortunate that they had to borrow from one of the most well-known trance classics for the verse instrumental portions (as well as the chorus, but that's typical, and in most cases — particularly this one -- they have improved upon the original). Therefore, the level of creativity has certainly taken a hit here, but that's Scooter for you. Still, if you enjoyed their classic sound from before their direct dive into jumpstyle country, this single follows in line with what fans could have come to expect a few years back. It's wild, it's boisterous, and it's pure Scooter.